One of our favourite hot hatches is about to get bigger with today’s announcement at the Los Angeles motor show of the Volkswagen Golf R estate. With no GTI wagon below it in the range, you’d be forgiven for wondering if VW might have detuned the Golf R estate’s performance to fill in the gap. Not a bit of it. Under the Golf R estate’s bonnet growls the same 296bhp 2.0-litre turbocharged engine found in its hatchback siblings. Driving all four wheels using VW’s 4Motion system via a six-speed DSG automatic gearbox, the motor produces 380Nm of torque from just 1,800rpm, ensuring acceleration from either a standstill or at speed is rapid. Sprinting from 0-62mph takes 5.1 seconds – just 0.2 seconds slower than the hatch version – while top speed is restricted to 155mph. Ensuring you can maximise the performance on tap, the 4Motion arrangement diverts an appropriate power balance to the front or rear even before wheel spin occurs. Working in conjunction with four electronic differential locks (EDL) that power can then be diverted to the left or right side of the car as required. As with the hatch versions, the Golf R estate’s steering is also more progressive, needing just over two turns from lock to lock. 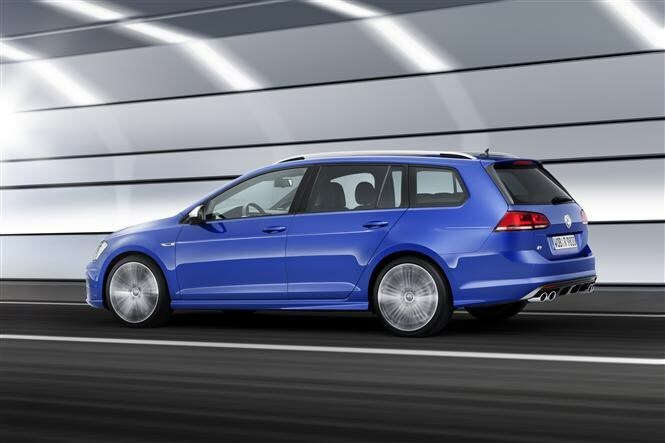 Combined with VW’s XDS+ system, which gently brakes the inside wheels when cornering, and Dynamic Chassis Control (DCC) to vary the suspension’s stiffness, the Golf R estate’s promise on paper is appetite whetting. High performance cars can’t escape the reality of needing to be efficient and the Golf R estate is no different. Volkswagen claims an overall fuel economy figure of 40.4mpg (the hatch is 40.9mpg) and CO2 emissions of 163g/km, four more than the hatchbacks. 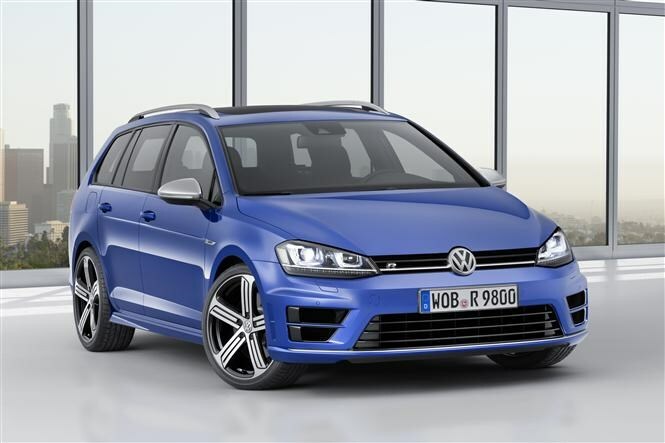 From the front the VW Golf R estate’s styling mirrors that of its hatchback counterparts, with a large-grilled bumper and bi-xenon headlamps complete with LED day running lights. 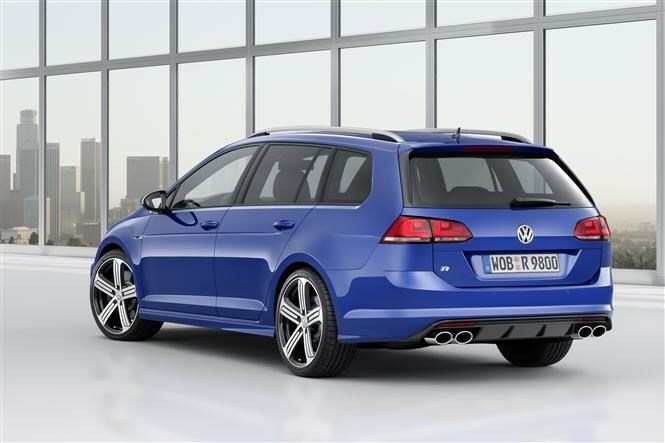 It differs at the rear from less powerful Golf wagons with a more purposeful rear bumper housing a gloss black diffuser and four chrome-tipped exhaust pipes. The tail lights are finished with deeper cherry red lenses, while above those the rear screen is flanked by a pair of aerodynamic fins. Completing the exterior makeover are distinctive 18-inch ‘Cadiz’ alloy wheels, which can be upgraded to 19-inchers of the same design or racing car-esque ‘Pretorias’ with a dark grey or black finish. Inside there’s carbon fibre-look trim, blue ambient lighting, a special ‘R’ steering wheel complementing other detail changes and a choice of Alcantara faux suede or Nappa leather seats. Importantly none of the Golf estate’s practicality has been lost in its high performance upgrade, the boot still providing 605 litres of cargo space in five-seater mode and a total volume of 1,620 litres with the 60:40 split rear bench folded. 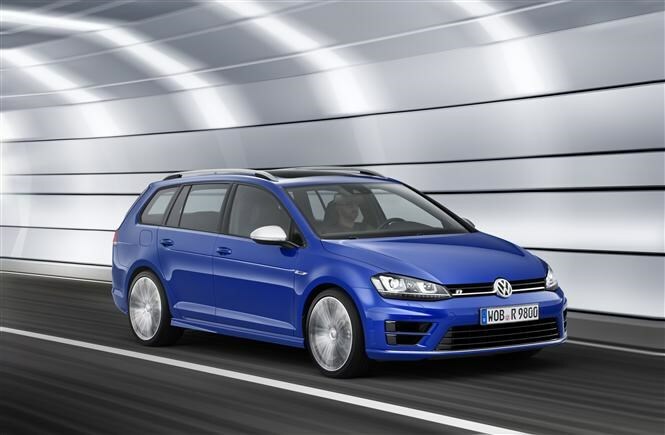 Prices for the Golf R estate will be confirmed closer to the spring 2015 on sale date, but we expect it to be in the region of £27,000. Return soon for our definitive road test verdict on the new Volkswagen Golf R estate and discover if it really does combine exciting pace with practical space.